For years, Common App has produced the First Year Requirements Grid for incoming first-year university students. The First Year Grid “has been a resource on the first-year side that students and counselors have come to rely on, and we hope [the Transfer Requirements Grid] dedicated specifically to the transfer application becomes an equally valuable tool”, the Common App website reads. According to the Common App website, a 2016 report from Columbia University's Teachers College shows that about 80 percent of the nearly 1.1 million students who enroll at 2-year institutions intend to transfer and earn their bachelor's degrees. Only 14% of this group end up reaching this goal in six years. Using the Common App Transfer Requirements Grid may work to increase the odds by helping students better organize their transfer application requirements. 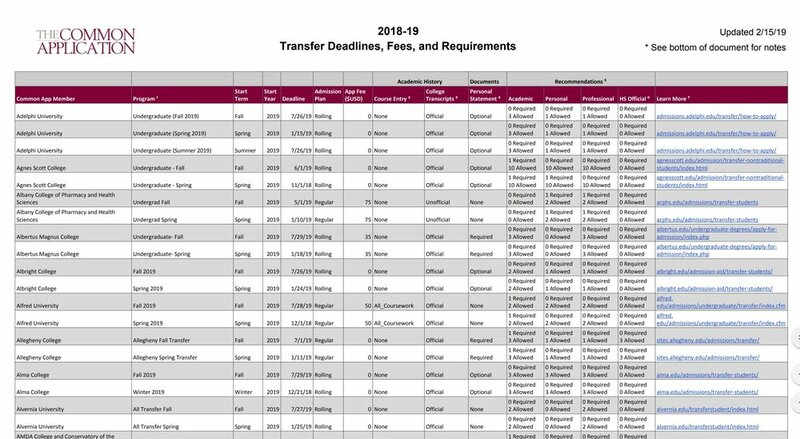 Check out the Transfer Requirements Grid below or download the latest version here on the Common App website.